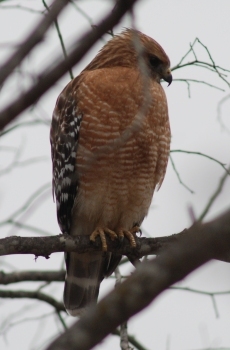 Red-shouldered Hawk perching in a tree near the lily pond this morning. Stayed put long enough for me to put the bigger lens on the camera and get this and a few other good shots. May any mousies headed to the warmth of your house meet His Excellency. I certainly hope so. But this being B.lineatus, which also eats frogs, toads, small lizards, and small snakes, I hope she (from the size, I think she, but I could be wrong) will confine herself to the vermin, and let my amphibs alone. Nicely captured. What a beauty! Lovely picture, I hope she confines her self to rodents and that the amphibians are safely tucked up for winter. Thank you. I got lucky. I was hand-holding a 400mm lens and my hands aren't as steady as they were 40 years ago(the tripod was over at the other end of our place, where I keep it to set up by a wildlife guzzler.) There were a lot of blurry shots and just a few good enough to keep. But that lens is a wonder. Thank you...it's a beautiful bird. It was overcast. Years back, I lucked into a used 300mm Nikkor lens--a remarkably fast one--when a newspaper switched from Nikon to Canon. The outside shows a lot of wear, but the mechanics still work and the lenses had no damage and all that Nikkor quality. Snapped it up, added a good-quality extender thingie (that's not the name, but my brain's fuzzy) that made it a 400mm equivalent, and it became "Bird One" for me--an outstanding bird lens. Also great for taking pictures of perched dragonflies, and (if they're far enough away) larger critters. It's heavy (for me) and I usually use it with a monopod or tripod. Occasionally, I get a really good shot hand-held, but age is playing hob with both the steadiness of my hands (I used to be able to shoot sharp half-second exposures with an old slow rangefinder my mother had) and my vision--cataracts. Autofocus is my friend these days. Gorgeous photo. I like the one with her (?) head looking to the right, but it's nice that you captured a few angles of the head. I can see how she moves (it's pretty cute). As a birder and photographer - well-shot!